Definition at line 152 of file dde_private.h. Definition at line 161 of file dde_private.h. Referenced by WDML_Initialize(), and WDML_InvokeCallback(). Definition at line 162 of file dde_private.h. Referenced by WDML_EventProc(), WDML_Initialize(), and WDML_ServerNameProc(). Definition at line 158 of file dde_private.h. Definition at line 168 of file dde_private.h. Referenced by DdeAbandonTransaction(), DdeEnableCallback(), DdeUninitialize(), WDML_AddConv(), WDML_EventProc(), WDML_FindConv(), WDML_Initialize(), and WDML_RemoveServer(). Definition at line 165 of file dde_private.h. Referenced by DdeUninitialize(), and WDML_Initialize(). Definition at line 155 of file dde_private.h. 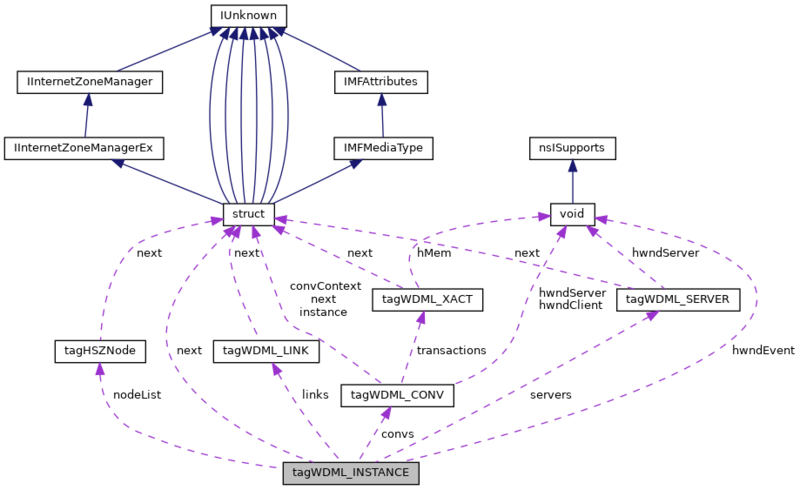 Referenced by WDML_AddServer(), WDML_CreateServerConv(), WDML_FreeAllHSZ(), WDML_GetInstance(), WDML_IncrementInstanceId(), WDML_Initialize(), WDML_MakeHszFromAtom(), WDML_NotifyThreadDetach(), and WDML_ServerNameProc(). Definition at line 164 of file dde_private.h. Referenced by DdeGetLastError(), DdeNameService(), WDML_AllocTransaction(), WDML_Initialize(), and WDML_SetAllLastError(). Definition at line 169 of file dde_private.h. Referenced by DdePostAdvise(), WDML_AddLink(), WDML_FindLink(), WDML_Initialize(), WDML_RemoveAllLinks(), and WDML_RemoveLink(). Definition at line 157 of file dde_private.h. Definition at line 163 of file dde_private.h. Definition at line 154 of file dde_private.h. Definition at line 160 of file dde_private.h. Referenced by WDML_DecHSZ(), WDML_FindNode(), WDML_FreeAllHSZ(), WDML_Initialize(), and WDML_InsertHSZNode(). Definition at line 167 of file dde_private.h. Referenced by WDML_AddServer(), WDML_FindServer(), WDML_Initialize(), WDML_RemoveServer(), and WDML_ServerNameProc(). Definition at line 156 of file dde_private.h. Referenced by WDML_GetInstance(), WDML_Initialize(), WDML_NotifyThreadDetach(), and WDML_SetAllLastError(). Definition at line 159 of file dde_private.h. Referenced by DdeConnect(), WDML_CreateServerConv(), and WDML_Initialize(). Definition at line 166 of file dde_private.h. Referenced by DdeEnableCallback(), WDML_AddConv(), and WDML_Initialize().